I love historical fiction and this novel is one of the best that I have read recently. It is set in the not-too-distant past of the last century, during the Depression-era 1930’s. The author states that the story is inspired by the diary of a liaison officer in the US army assigned to accompany a party of Gold Star mothers to France. Here is the history: Although Americans fought for just over a year in World War I, there were 116,516 soldiers killed and more than 30,000 were buried in U.S. cemeteries in Europe. In 1929, the U.S. Congress, responding to widows and war mothers lobbying for compensation of their loss, passed legislation to fund travel for mothers of fallen soldiers to visit their sons’ graves in France. During a three-year period, 6,693 mothers made the trip. This is a fictional account of five American women – Gold Star Mothers – who travel to France to visit the graves of their sons buried in a cemetery near Verdun, one of the bloodiest battles of the war. The story begins with single-mom Cora, with her hardscrabble life in Maine. It follows her journey from small-town USA to the grave of her son, Sammy, in France, along with 4 other women who have lost a son or sons in the war. These women from vastly different backgrounds, with little in common, become friends on the trip, as they share their experiences of loss and learn something about themselves along the way. At the Meuse-Argonne American cemetery each mother confronts her loss again, 13 years after the war. Surprising and shocking events take place there that touch all of them. Then, just before leaving France, Cora experiences a surprising turn of events that lifts her spirits. 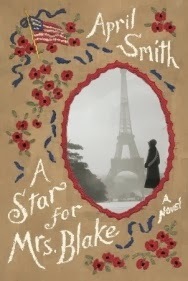 April Smith is an excellent, descriptive storyteller who captures small-town America and small-town France perfectly. The description of the Verdun battlefield is rich in details and very moving. Obviously a lot of research went into the story. This is a very poignant, emotionally-charged story on many levels, so be prepared to cry. The overwhelming sense I came away with is the futility of war. Standing at a battlefield Cora felt “...so much pain as she stood there. She was like a lightning rod for pain. Her soft woman’s body seemed to fill with the silent wasted loss of hundreds of thousands of young men whose nonbeing was as tangible as the missing generations of oak trees.” World War I was called the Great War, the “war to end all wars.” One hundred years later, wars continue to be fought.